Selenographic Coordinates is the formal name given to moon coordinates. 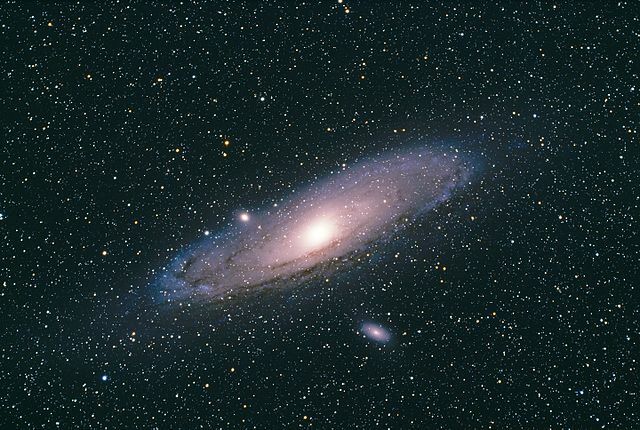 They are similar to the latitude and longitude system we use on Earth. Latitude: How far north or south of the moon's equator an object is. 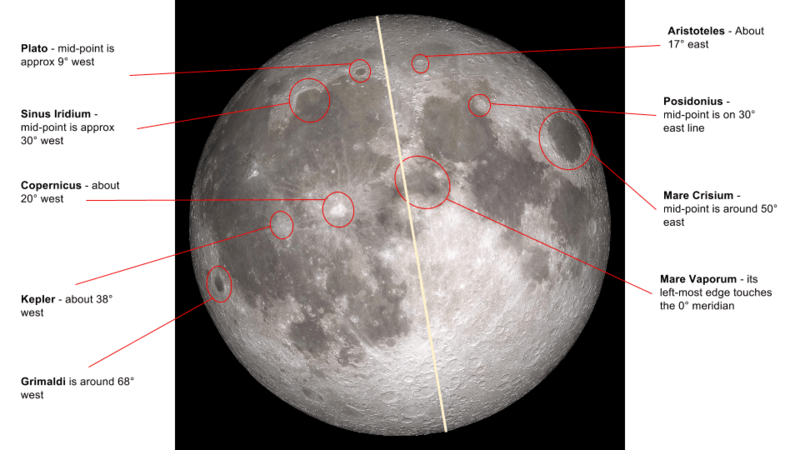 Longitude: How far east or west (left or right of the moon as we look at it) from the middle of the moon’s surface, which is called the moon’s prime meridian. The prime meridian is an imaginary line down the center of the moon which joins the north and south poles. It is the closest part of the moon to Earth. The prime meridian of the moon is the 0° point between east and west. Historically, it has been based around the small crater Mösting A but is scientifically defined by laser today. Those laser measurements actually make Mösting A about 5° west of the meridian! Coordinates of longitude are given as a measurement of degrees to the east (right) or west (left) of this line. Because we only ever see one face of the moon, the most we can see is 90° east and west, and perhaps a little further during librations. In reality, the curvature away from us means that seeing objects on the moon’s surface beyond 80° east or west is very hard to achieve. Point your telescope at objects which are in long shadows, i.e. they are near the terminator. The moon's terminator is not a murderous cyborg from the future, but is instead the line which separates light from dark or day from night on the moon’s surface. Using moon coordinates means we can define exactly where the sun is rising (or setting during the waning phases) on the moon's surface for any given day of its phase. We can choose objects (such as off the lunar 100 list) which are near it and enjoy hunting for them. At the first and last quarters, the terminator falls along the prime meridian, which is 0°. If you were on the moon's surface you'd experience sunrise at first quarter and sunset at last quarter. At new moon, the terminator is 90° east and over the next 14 days it moves about 13° westwards per day over the face of our neighbour. At full moon, the morning terminator (scientifically called the selenographic colongitude) is at 90° west. After that, the morning terminator is moving over the far side of the moon and instead we can now see the evening terminator moving from east to west. 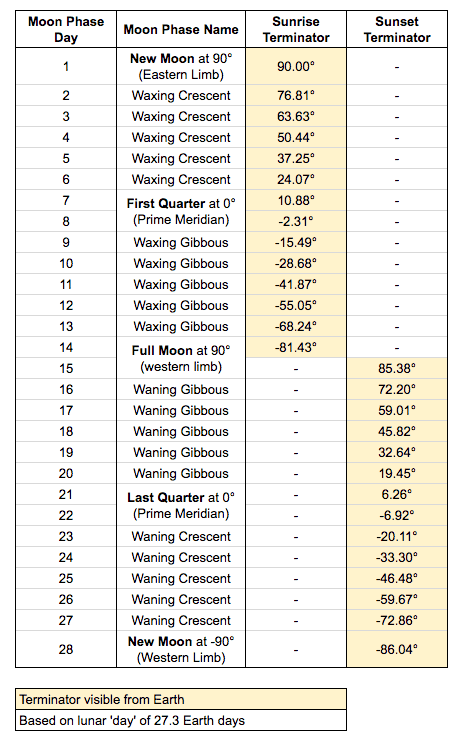 This table shows you the location of the terminator for each day of the moon’s cycle and whether it is the morning or evening terminator on the moon’s surface. 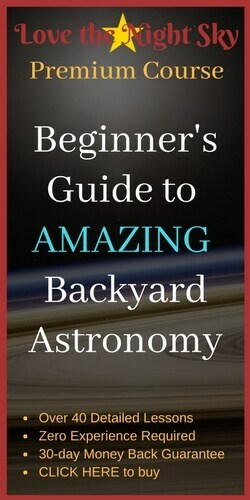 Each of the Lunar 100 has its own coordinates, and you can find them all listed in my (very inexpensive) guide to discovering the lunar 100 for yourself. Each lunar surface feature is given a reference coordinate, which is simply written like this: 16S 18W or 5N 58E. The measurements can go to decimal places and will properly use degrees, minutes and seconds (°, ', ") but that is overkill for our backyard needs. 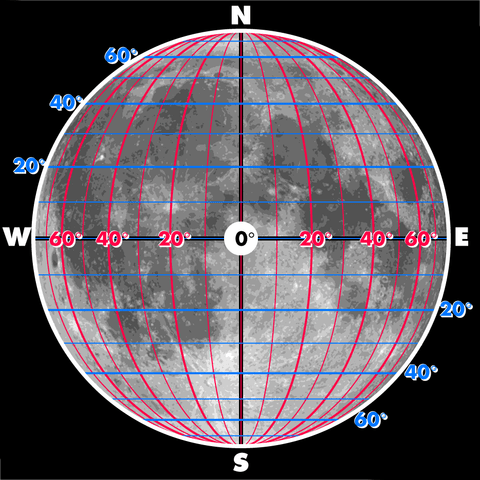 It’s not just the Lunar 100 that have these coordinates, of course, every lunar feature has them and when you invest in a lunar map (see this guide to using them) you’ll see that they list every major feature along with the coordinates for finding it. The first number followed by N or S is degrees north or south of the equator. The equator itself is 0° N and the poles are 90° north and south. The second number, followed by an E or a W is the longitude measurement in degrees. This is the part of the moon’s coordinate system which says how far east or west the object is of the prime meridian. The meridian itself is 0° the eastern limb of the moon is 90° E and the western is similarly 90° W.
Just be aware that with the moon’s libration, the edges you can see will almost never be exactly 90° - one side will be a little less, the other a little more. One convention that’s worth noting is that if E/W is not specified, then any west measurement will be shown as a negative number (as in the chart above). Once you have the coordinates of the feature you want to look at, check the moon calendar in the Guide to the Lunar 100 pack, which has it set out by day to Dec 2017, or consult TimeandDate.com/moon for today’s phase. To make things a little easier to find, I’ve highlighted some features which are obvious to the naked eye (or at least through binoculars) to give you a sense of the east/west measurements. Lunar coordinates are much more vital to NASA and other space agencies to make sure landings happen in the correct place. Because of that, there is an astounding amount of detail underpinning the system, if you want to read more (actually, a lot more), check out this "Lunar Constants and Models Document" from JPL. As for us... well the closest we can get to a lunar landing is to point our telescopes at some previous ones, and you can find the coordinates for them here. 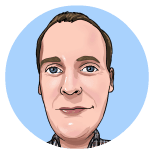 I hope you make the most of your new-found knowledge about the moon’s coordinate system and enjoy finding features which you’ve never quite been able to find before.